Jaw Bone Pain Symptoms | What Are The Likely Causes? Jaw Bone Pain symptoms is one of those topics that I think is poorly covered by most health websites. When I had a look around online to see if I felt this was an area that I could contribute to, I was surprised by the lack of information. Sure, there were plenty of results on Google, but the information available wasn't great, even on the sites written by professionals. So, here's my contribution to the topic of Jaw Bone Pain, the symptoms and possible causes, what to look for, and possible treatment options! First off, let's deal with the causes that are pretty obvious; these are those instances where you will already have a good idea of what's causing your pain. Trauma. This is where you've been hit in the jaw, whether it's in a car or motorcycle accident, a sports injury, assault, i.e. with a baseball bat, or something similar. You KNOW you've taken a hit, however it happened. And now you have jaw bone pain. So what's causing the pain in the two situations above? In both cases, the basic cause is ACUTE INFLAMMATION. Imagine you've hit your thumb with a hammer. The pain you get afterwards is from acute inflammation, where the body is trying to repair the tissue damage that has occurred. The affected area swells up, as blood circulation increases and tissue fluid leaks out of the blood vessels into the surrounding tissues. White blood cells flood the area, trying to deal with any possible bacteria and also removing dead cells. This whole process HURTS! Take anti-inflammatory medications such as ibuprofen. I recommend 600mg every 8 hours. Cool the area with cold packs. A bag of frozen peas, for example, can work well. Avoid excessive movement of the area, and keep it elevated. These are basic surgical principles that are less easy to implement where you have a sore jaw, but basically it means moving your jaw as little as possible (try to avoid yawning, eating hard or chewy foods), and keep your head above your heart - ie. avoid lying down flat. Keep your head propped up. An ADDITIONAL possibility after trauma to your jaws is of course a broken jaw or jaw bone fracture. Sometimes, it's NOT obvious you've got a broken jaw, and if you're sitting at home reading this instead of getting treatment in the ER then it's likely you're wondering about whether you've broken your jaw or not. What are the signs of a broken jaw that you should look for? You will be finding it difficult to move your lower jaw, whether it's from side to side or else just trying to open your mouth in a straight line. When you DO try to open your mouth, you can only open it slightly, and it's painful. When you try to bring your molar teeth together, they don't meet up like normal. They may meet on one side of your mouth, but there's a gap between your top and bottom back teeth on the other side. You may also feel that your jaw is "out of line", or somehow it doesn't feel like it's sitting straight. And of course, you're likely to have an intense pain in one area of your jaw. WHAT ARE THE OTHER CAUSES OF JAW BONE PAIN? The next possibilities are NOT obvious, unlike trauma or recent surgery. The most common cause will be a DENTAL INFECTION of some sort. This may be an abscess on the root of a Dead Tooth. More seriously, it could be a Jaw Bone Infection, which includes osteomyelitis. Less commonly, jaw bone pain can be caused by a large cyst in the bone. This can also cause a hard, bony swelling, and sometimes a tingling or sensation of numbness in the lower lip and chin area, as the expanding cyst presses on the main nerve of the lower jaw. If the cyst becomes infected, then symptoms develop more quickly, over a shorter period of time compared to the gradual, slow expansion of a typical jaw bone cyst. A cyst is a fluid-filled cavity within the bone of the jaw. Some contain hair or skin cells, others may contain tooth material (a dentigerous cyst). Treatment is by surgery to remove the cyst. Outlook is excellent. A sinus infection can cause quite severe pain in the upper jaw bone, just under the eye on the affected side, often accompanied by what feels like toothache in the teeth just below the sinus. Normally there are additional symptoms of blocked nose, earache, and sometimes puffiness under the eye. Treatment is with antibiotics and decongestants. Outlook is excellent. Occasionally, surgery may be needed to improve the drainage of the sinus. Nerve compression in the lower jaw can cause marked jaw bone pain, when it's caused by a lower full denture pressing on the nerve that supplies the chin area on the affected side. This occurs mainly in older patients, where the lower jaw bone has shrunk significantly, exposing the nerve under the gum to pressure from a denture. Treatment involves adjusting or re-lining the denture. Outlook is moderate. Jaw bone cancer can cause significant jaw bone pain, usually when it's more advanced. It is accompanied by a slight swelling of the jaw bone, and maybe a numbness or tingling in addition to the pain. For more information about this, go to jaw bone cancer. The cancer may be either primary, where it is the only cancer in the body, or else it may be secondary, where the cancer cells have travelled to the jaw bone from another tumour elsewhere in the body, even after the first tumour has been successfully treated, such as kidney cancer. Treatment may involve surgery, chemotherapy, or radiotherapy, sometimes a combination. Outlook depends on several things, mainly how advanced the tumour is. Pain the the jaw bone near the ear may be from the jaw joint, usually caused by intense tooth grinding (especially at night, when you are deeply asleep); sometimes it is caused by a general joint condition such as arthritis or rheumatism; the last possibility is where the jaw joint has had a trauma, where it's taken a blow or been hit by something. Treatment may include a bite splint to wear at night, anti-inflammatory drugs, and rest. 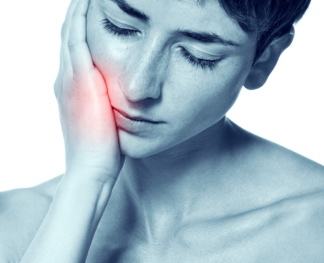 FINALLY, jaw bone pain may be caused by a neuralgia such as trigeminal neuralgia, although it's rare to experience the pain only in the jaw bone. The pain typically affects the whole side of the face. Treatment is by medication, with varying degrees of success. Surgery may also be suggested, but it can be risky. MY GUIDE TO JAW BONE PAIN cannot be exhaustive; there are other, rare, conditions that may also cause pain in a jaw bone. If the cause of your jaw bone pain is relatively clear, then you can follow my recommendations. In all other cases, especially where there is swelling and tingling sensations, you should get a medical opinion. The SOONER you get a medical opinion, the faster, simpler and better the outlook will be. And less painful.